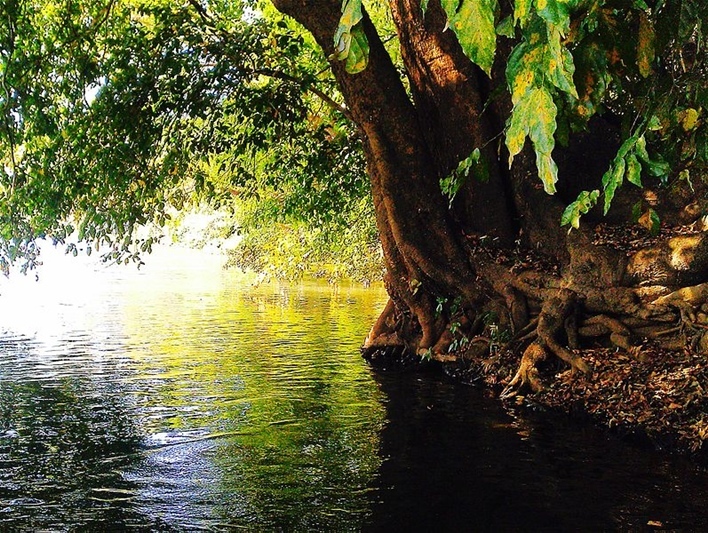 Dandeli is a small town located in the Uttara Kannada, along with the Western Ghats on the banks of the river Kali. The place contains pristine lush deciduous forests which are full of rare species of trees, plants, and animals. The Black Panther is seen in these dense forests of Dandeli. Even the place is home to Lambanis, Negroid Siddis, and nomadic Shepherds. Dandeli is famous among adventurers for trekking, water rafting, nature walks, a night camping in the jungle, visiting caves, angling etc. 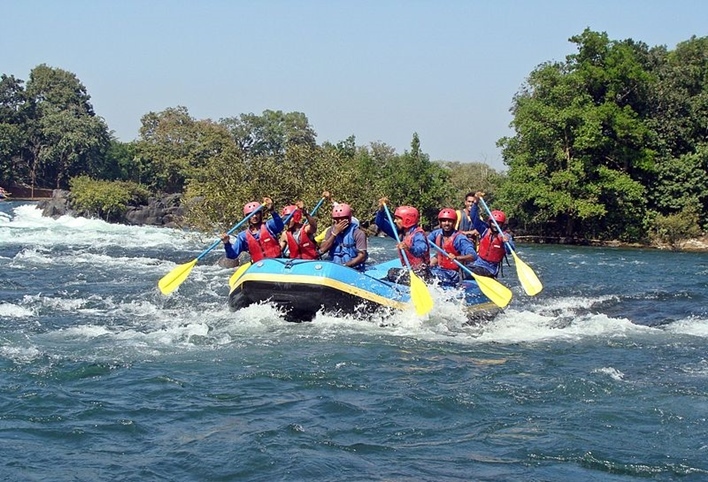 Dandeli has a varied population consisting of many migrants from various parts of India. Hence, they maintain the diversity in all the festivals and cultural equality in the place. Kannada is the major language used in the place. 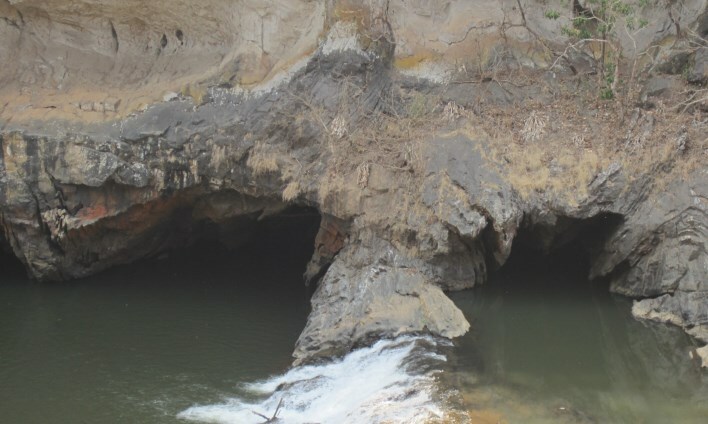 Kaval Caves: The limestone caves are located around 25 km inside from the base camp of Dandeli. These caves are believed to be formed with the result of volcanic actives over years ago, the caves are deep inside the forests. The cave dimension is very small that one must crawl in at some points`. The cave has many stalagmite formations. The pungent smell of bats is also present inside the caves. One of the stalagmites found inside depicts the shape of Shivalinga, where many devotees come to light their sacrificial fires here on Shivarathri. The cave is lit with candles, yet carrying a torch along would be advisable. The trekking back to the top is also quite daring. Sykes Point: An interesting point named after the discoverer of it, A British engineer. 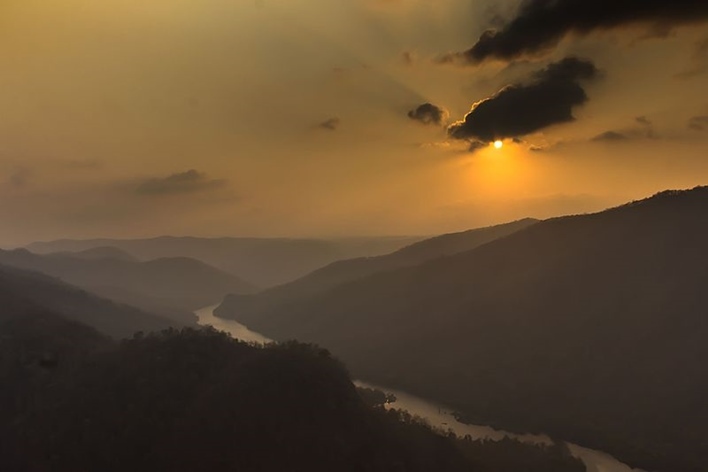 The place presents a spectacular and mind-blowing panoramic view of the forests, hills, and valleys as well as the magnificent river Nagajhari that flows into the river Kali. The panoramic view of the place and the river is just available from this point. Another major attraction is the sighting of giant hornbills drifting from one side of the valley to the other. The sunset from this point is also a never miss. The trekking up to the point is only available to visitors who have received permission from Karnataka Power Corporation Ltd. (KPCL). The trek along the river from Kulgi through the lush green forests which around 12km to Syke’s point. Special permissions are required for the trekking as well photography. The power station of Nagajihari is located way below the Syke’s point. Dandelappa Temples: One of the oldest temples in the city of Dandeli is the Dandelappa temple. The Dandeli falls in the Malnad region of the Sahyadri Mountains, clad with a green belt of every green bushes and tree that makes the place magical. The temple lies amidst these enchanting locations of hills and valleys. Syntheri Rock: Around 32 km from the Kali wilderness camp nearby the gushing waters of the river Kaneri is a 300ft monolith granite rock. The rock contains some hollow spaces on it due to erosion. Several beehives can also be seen on these rocks. The rock is deep inside the forest and can be reached with a jeep ride and walk into the forest. Molangi is an ideal camper’s hideout. The place is located around 11 km from the Wilderness camp in Kali and is deep in the dense forest. The river Kali cut through the rocks and cliffs and slopes etc. The place is ideal for a picnic and watching the nature closely. Shiroli Peak: Inside the Dandeli wildlife sanctuary is the Shiroli peak, which is 25km from Dandeli. The peak is the highest point in that region from where one can get the view of the magnanimous Sahyadri Mountains. The town is an adventurer’s paradise. Many of activities can be done to quench the thirst of adventure. Other activities include Kayaking, Canoeing, Mountain biking, rafting etc. in the Kali adventure camp. The trekking is also an activity included. Swimming is also an ideal sport to enter but beware of crocodiles in the river Kali. Except for summer season, the rest of the months are an ideal time to visit the place. From Bangalore (458 km) drive via Tumkur and Dharwad and reach Dandeli through Haliyal. The town is well connected to major places like Bangalore, Dharwad, and Belgaum. Dharwad (56 km) and Hubli (53 km) are the nearest stations.